I was so in love with the flute that I couldn’t contain myself; I played with such joy, I talked about everything flute with so much enthusiasm, and then….I wrote about my musical life, too. I expressed struggles with my teacher, the hilarious antics of my students, what it was like to perform a concert in a prison, and the incredulous experience of watching James Galway record a CD with the London Symphony. I wrote from my heart. We don’t have many “pleasure” books in the flute community — the kind that inspire, uplift, and are infused with love, spirit, and joy. 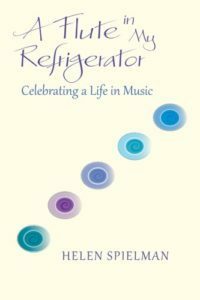 A Flute in My Refrigerator is one of the few, and it speaks to adult amateurs, flute teachers, students, and professionals. I’m honored that Flute Specialists chose a few excerpts to share in its newsletter. My 13-year-old flute student, Eric, asks if he can come and use my tuner for a science project due the next day. When Eric arrives, I give him my tuner and leave him to his own devices. A short while later I get thirsty and go to the kitchen to get some juice. There on the refrigerator shelf, carefully nestled on top of a folded towel, are the three parts of Eric’s flute. Life is full of surprises-small ones, like a flute chilling among eggs and milk cartons, and large ones, like my life in music, which also began as something of an experiment and grew into two life-affirming careers. Teaching flute was the first. I never aspired to be a musician. I am amused and amazed that I ended up becoming one. And then I began to write as a way to share my love for music. I am endlessly grateful, because these aspects of myself have brought me boundless joy, rich friendships, exciting adventures, and fabulous opportunities. Many of them are here in this collection of articles I wrote between 1992 and 2010. Reading them now, I appreciate more than ever how teaching and writing about music led me to experiences that proved to be wider and deeper than anything I had dreamed in my childhood imaginings. This summer, so many of my students participated in flute and music activities that I decided to invite them out for ice cream, just before school got underway, so they could share their experiences with each other. Last Sunday evening, we met at The Inside Scoop, a small place not far form the university campus at the center of town. Each student told a little about what they did over the summer - touring Europe as principal flute of a national band, attending Jeanne Baxtresser’s Summer Masterclass, going to a band camp, and so on. I was especially pleased that two of my new students joined us, and they shared as well. I had said that they could bring flutes and play before eating, so as not to get sugar on the pads. The owner of the place was happy to allow us to play our flutes. However, no one was “in the mood.” So, we got our treat: “The Kitchen Sink.” Fifteen scoops of ice cream, six toppings, fudge sauce - a decadent indulgence. You get the picture. They had no trouble scarfing it down while talking flute talk (a conversation that was not directed by me). Who won what competition, who plays too sharp in band class, what pieces they were going to play for recital, and so on. They were really into flutes! The exception was the youngest, who was mostly into discovering what toppings he could find at the bottom of his bowl. Then, after they ate, they decided to play. Fine with me. I did ask them to go rinse their mouths with water first. Every one of them got up, right there in the noisy ice cream parlor and played a piece of music. They are such hams. The other customers in the shop paid us no attention, and we paid them no attention. The kids got a big kick out of it, saying they’d never played in an ice cream place before, that it was really “cool.” We heard everything from a quarter note rendition of Beethoven’s Ode to Joy to the Burton Sonatina. We were there for over two hours before they called their chauffeurs (moms or dads) to pick them up. They had fun, and I did, too. Finding my niche as a musician has been the most important and difficult part of my musical journey. Memorizing the minor scales into the fourth octave and acquiring a fast double tongue technique were easy compared to the challenges I encountered during my quest to find my true musical self. The dictionary defines a niche as “a shallow recess in a wall.” Imagine the ruins of an ancient building, with big stone bricks and small hollowed-out spaces. In my mind’s eye I see an ancient woman stashing her corn kernels in one niche and maybe her bone sewing needles in another. Another definition of a niche is “a position in life to which a person is well suited.” Since childhood, I’ve loved playing the flute. I was good at it, but I never aspired to be a professional musician. From the time I was 12, I had a deep desire to teach blind children, and after earning my Master’s in Special Education I taught visually impaired children for 13 years. I kept playing my flute but felt confused about making music. I didn’t know where I fit in or what my niche looked like. I couldn’t understand why others younger than I were so much more competent, and I often felt shame about my playing. I didn’t want anyone to hear me. One day, as if by accident - although I believe that nothing is truly an accident - I came across Stephanie Judy’s book, Making Music for the Joy of It. That book changed my life, and I don’t say that about many books. For the first time, I had a name for what I was: amateur musician. And I learned that being an amateur wasn’t a lesser form of being a professional. Being an amateur musician is something good and wonderful, a source of pride in its own right. Our task as amateurs is not “to play music perfectly but to love it deeply,” Stephanie wrote, so I started looking for my niche. Writing is my most recent niche. I never aspired to be a writer, but I was so excited about flute playing that I wanted to talk about it all the time. Writing became another medium. My articles are published all over the world, and I write for and help manage the FLUTE List online discussion group. Remember that wall filled with many niches? Claim one - or several - for your own. If the niche you want isn’t available, you can create it. People often say that I’ve done a good service for the community by hosting the musicales. I’m happy to serve the community, but truthfully, I started them for myself. I wanted a performance venue, and I created it. Other people have found different niches. One of my adult students loves chamber music. Although she’s a full-time physician and mother of two teenagers, she finds time to play in groups several evenings a week. Some folks want to play alone on the beach, just for the seagulls. Other enjoy performing for senior citizens in retirement communities or coaching children in schools. Many find joy in a flute choir or a village band or orchestra. Myriad niches exist for those who make music. Ask yourself these questions: Why are you making music? What really makes your soul sing with joy? And, most importantly, what would you do if you knew you couldn’t fail? For an amateur, there is no failure. Just do what you love. Think about amateur tennis players. They reserve a court, knock around a few balls, and keep score. Someone wins, someone loses, and they all leave feeling great. They don’t have the same form as the players at Wimbledon, nor do achieve the same ball speed or score. They play because they enjoy it. And that’s how it can be for amateur musicians. With the emphasis on giving, there is no need for fear. Imagine that a friend makes you a beautiful piece of pottery, although the sides are a little lopsided and the glaze isn’t quite even. Wouldn’t you receive that pot and cherish it within the context of the love in which it was made and given? That’s how people will receive your music if you give it with love. I implore you not to go near the land of “Should.” Don’t think about what your parents want you to do or what your teacher thinks you should do. Don’t imagine how you should play as compared with someone else. Exposing your heart can be scary, but it’s human. Trust your heart, because that is where your power is. Claim your musicality. Empower yourself to use your music to radiate love and caring. The world is in serious trouble, and music has the power to transcend our differences and create vibrations of change. You have the power to make that happen. I ask you not to underestimate that power of the beauty of your playing. You may be sitting in one little niche in a huge wall, but if it’s your special niche, the one to which you’re well suited, you can light up the whole world. 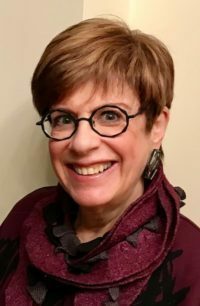 Helen Spielman has been an inspiring voice in the field of performance anxiety and flute teaching for three decades, teaching countless musicians to take the excellence they produce in a relaxed practice room to the high-stakes arena of auditions, recitals, and pressure-cooker orchestras. She had guided musicians who, ready to quit their careers, regain their original love of music and return to the stage with joy. Helen Spielman has taught at international conventions, prestigious music conservatories, music festivals, and private studios in Africa, Europe, Central America, and around the US. She was appointed a Fulbright Senior Specialist in 2010, and is a Distinguished Honorary Member of Sigma Alpha Iota, the international music fraternity. Helen lives in Chapel Hill, NC with her husband. Please visit PerformConfidently.com.